Home / Uncategories / The Top 5 Cancer Causing Foods !!! The Top 5 Cancer Causing Foods !!! I was going through some websites regarding health and eating habits suddenly a website popped in with the picture & being a medical student I was started having curiosity as soon as I read the Title 'Top 5 Cancer Causing Foods' . I straight went up to the link and read the whole article thoroughly & what I had read left me speechless and shocked cause the food which we most likely to eat they contain some 'CANCEROUS' ingredients and they are so common in West especially . Lets go straight to the article but before that I'd like to let you know this is not my original content Im just writing it up to create awareness & to let the people around/in my circle to beware, Not necessary they gonna end up like its something some what hatred content but atleast I'll be relaxed that I have done my part . Im going to post up they original link at the end too from where I have read & sharing the information . Ever wonder which foods should be strongly avoided by those at high risk for cancer? We can begin identifying cancer-causing foods once we know which ingredients in our food cause cancer. Some of those ingredients are food additives and chemicals used to enhance taste, while others are used strictly for appearance or to increase product shelf life. The key to avoiding cancer-causing foods is knowing which ingredients are carcinogens -- or cancer promoters -- and then reading food labels to permanently avoid consuming those ingredients. Cancer tumors develop, in part, by feeding on sugar in the bloodstream. If you eat lots of sugary snacks loaded with simple carbs, you're loading your bloodstream with the chemical energy needed for cancer cells (and tumors) to proliferate. No biological system can live without fuel for its chemical processes, including cancer cells. Thus, one of the strategies to pursue for any anti-cancer diet is to eat low-glycemic diet. That means no refined sugars... ever! No refined grains (white flour, for example), no heavy use of sweeteners and the lifetime avoidance of sugary soda pop. Aside from starving tumors, eating foods low in sugar and avoiding simple carbs will also keep your weight in check while helping prevent blood sugar disorders such as type-2 diabetes. What to avoid on the labels: high-fructose corn syrup, sugar, sucrose, enriched bleached flour, white rice, white pastas, white breads and other "white" foods. Hydrogenated and partially hydrogenated oils -- another danger -- are developed from otherwise harmless, natural elements. To make them hydrogenated, oils are heated in the presence of hydrogen and metal catalysts. This process helps prolong shelf life but simultaneously creates trans fats, which only have to be disclosed on the label if the food contains more than 0.5 grams per serving. To avoid listing trans fats, or to claim "trans fat free" on their label, food manufacturers simply adjust the serving size until the trans fat content falls under 0.5 grams per serving. This is how you get modern food labels with serving sizes that essentially equate to a single bite of food. Not exactly a "serving" of food, is it? Besides being a cancer factor, trans fats promote heart disease, interrupt metabolic processes, and cause belly fat that crowd the organs and strain the heart. The essential fatty acids that the hydrogenation process removes are responsible for a number of processes in your body. When trans fats replace these essential fatty acids, they occupy the same space without doing the same job. The "anchor" portion of the fatty acid is in place (which is how the body recognizes the fatty acid and puts it to work) but the chemically active part of the fatty acid is twisted, distorted, and missing vital parts. After the hydrogenation process, the fatty acid can't biochemically function in the same way. Things like brain cell function, hormones, gland function, oxygen transport, cell wall function (keeping things in or out of your cells) and digestive tract operation (putting together nutrients and blocking allergens) are adversely affected. Food manufacturers don't tell you this on the product label, of course. Your body needs essential fatty acids and you are programmed to keep eating until you get them. If you're only eating trans fats, you'll never feel fully satiated, because your body will never get the fatty acids it needs for essential function. Since cancer needs high blood sugar and low oxygen levels, a person with lots of belly fat who just can't seem to put down those trans fat cookies or crackers (also loaded with flour and simple sugars) presents the ideal environment for the development of cancer. Food companies add sodium nitrite into certain foods on purpose. This carcinogen is added to processed meats, hot dogs, bacon, and any other meat that needs a reddish color to look "fresh." Decades ago when meats were preserved, it was done with salt. But in the mid 20th century, food manufacturers started using sodium nitrite in commercial preservation. This chemical is responsible for the pinkish color in meat to which consumers have grown accustomed. Although today the use of refrigeration is largely what protects consumers from botulism and bacteria, manufacturers still add sodium nitrite to make the meat look pinkish and fresh. The nitrites themselves are not the problem. People get more nitrites from vegetables than they do from meat, according to research by the University of Minnesota. During the digestion process, however, sodium nitrite is converted to nitrosamine, and that's where the cancer problems begin. Nitrosamine is a carcinogen, but since it is not technically an ingredient, its presence can be easily overlooked on the packaging. Nitrosamines are also found in food items that are pickled, fried, or smoked; in things such as beer, cheese, fish byproducts, and tobacco smoke. Processed meats and bacon: These meats almost always contain the same sodium nitrite found in hot dogs. You can find some without nitrites, but you'll have to look for them in natural grocers or health food stores. Bacon is also high in saturated fat, which contributes to the risk of cancers, including breast cancer. Limiting your consumption of processed meats and saturated fats also benefits the heart. Doughnuts: Doughnuts contain hydrogenated oils, white flour, sugar, and acrylamides. 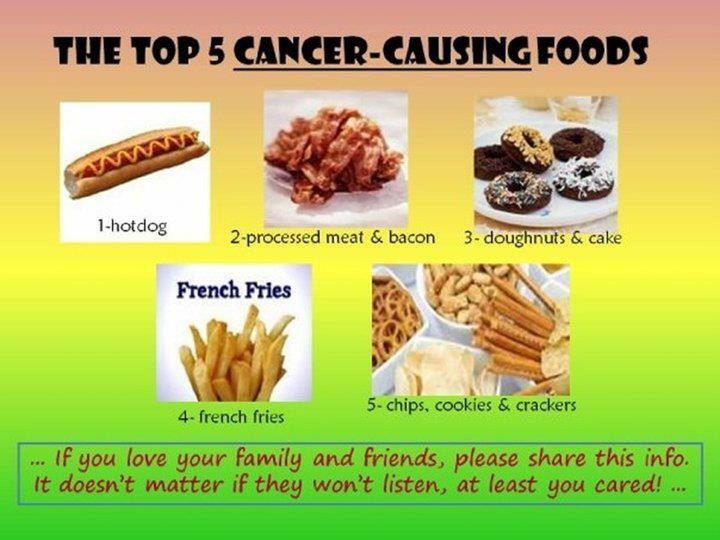 Essentially, they're one of the worst cancer foods you can possibly eat. Reader's Digest calls doughnuts "disastrous" as a breakfast food, and many experts agree it's probably one of the worst ways to start the day. French fries: Fries are made with hydrogenated oil and fried at high temperatures. Some chains even add sugar to their fry recipe to make them even more irresistible. Not only do they clog your arteries with saturated fat and trans fat, they also contain acrylamides. They should be called "cancer fries," not French fries. Chips / crackers / cookies: These generally contain white flour and sugar as well as trans fats, but it's not enough to simply look for these ingredients on the label; you have to actually "decode" the ingredients list that food manufacturers use to deceive consumers. They do this by hiding ingredients (such as hiding MSG in yeast extract, or by fiddling with serving sizes so they can claim the food is trans fat free, even when it contains trans fats (the new Girl Scout cookies use this trick). Eat foods high in natural vitamin C, a nutrient that deters the conversion of nitrite into nitrosamine and promotes healthy immune function. Make sure you get adequate amounts of cancer-fighting vitamin D through exposure to sunlight -- about 10 to 15 minutes each day if you have fair skin, or ten times as long if you have dark skin pigmentation. Stay well hydrated to ensure that your body rids itself of toxins. Avoid smoking and don't use conventional fragrance, cosmetics and personal care products -- virtually all of them contain cancer-causing chemicals. By the way, don't you find it interesting that the cancer industry seems to have no interest whatsoever in urging people to avoid eating sodium nitrite, or to stop using cancer-causing skin care products, or to get more sunlight on their skin so they can prevent cancer with vitamin D? I decided my self that Im not going to eat any of these things & please its a REQUEST do read ingredients when ever you want to buy any thing thats is canned,tinned pack or frozen or ready to eat . We want to save our time and most likely to go for the products that consume less time and ready to eat but we don't know how they are going to harm us in a long run by its ingredients which are highly cancerous . Please feel free to comment of you want to share any information , health care tips . 2 comments on "The Top 5 Cancer Causing Foods !!!" OMG noo but I live on "cancer fries" lol, I need to stop. I daily eat such food.